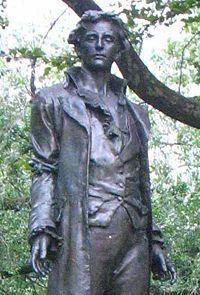 Nathan Hale (June 6, 1755 – September 22, 1776) was a captain in the Continental Army during the American Revolutionary War. Hale is best remembered for his "I only regret that I have but one life to lose for my country" speech before being hanged following his capture by the British after the Battle of Long Island. Widely considered America's first spy, a copy of Frederick MacMonnies' statue of Hale is located outside the headquarters of the Central Intelligence Agency in Langley, Virginia. He volunteered for an intelligence-gathering mission and was caught and executed. Hale has long been considered an American hero and, in 1985, he was officially designated the State Hero of Connecticut. Hale was born in Coventry, Connecticut. In 1769, when he was fourteen years old, he was sent with his brother Enoch to Yale College. He became very close to Benjamin Tallmadge, a fellow student who would later head Washington's intelligence service. The Hale brothers belonged to the Yale literary fraternity, Linonia, which debated topics in astronomy, mathematics, literature, and the ethics of slavery. Graduating with first-class honors in 1773, Nathan became a teacher, first in East Haddam and later in New London. After the Revolutionary War began in 1775, he joined a Connecticut militia and was elected first sergeant. When his militia unit participated in the Siege of Boston, Hale remained behind, but, on July 6, 1775, he joined the regular Continental Army's 7th Connecticut Regiment under Colonel Charles Webb of Stamford. He was promoted to captain and in March 1776, commanded a small unit of Lt. Col. Thomas Knowlton's Rangers defending New York City. They managed to rescue a ship full of provisions that was being guarded by a British man-of-war. During the Battle of Long Island in August and September 1776, which led to the capture of New York City by the British, via a flanking move from Staten Island across Long Island, Hale volunteered to go behind enemy lines to report on British troop movements. Sometime in September, he landed on the north shore of Long Island at what is now called Halesite, New York, on Huntington Bay. He disguised himself as a Dutch schoolteacher, carrying his Yale diploma to prove his credentials. During his mission, New York City (then the area at the southern tip of Manhattan around Wall Street) fell to British forces and Washington was forced to retreat to the island's northern tip in Harlem Heights (what is now Morningside Heights).On September 21, a quarter of the lower portion of Manhattan burned in the Great New York Fire of 1776. The fire was later widely thought to have been started by American saboteurs to keep the city from falling into British hands, though Washington and Congress had already rejected this idea. It has also been speculated that the fire was the work of British soldiers acting without orders, intending to punish and/or intimidate any remaining Patriots in the city—with unintended consequences, however. In the fire's aftermath, more than 200 American partisans were rounded up by the British. An account of Nathan Hale's capture was written by Consider Tiffany, a Connecticut shopkeeper and Loyalist, and obtained by the Library of Congress. In Tiffany's account, Major Robert Rogers of the Queens Rangers met Hale in a tavern and saw through his disguise. After luring Hale into betraying himself by pretending to be a patriot himself, Rogers and his Rangers apprehended Hale near Flushing Bay, in Queens, New York. British General William Howe had his headquarters in a manor house (called the Beekman Mansion) in a rural part of Manhattan, at what is now 51st Street and First Avenue. Hale reportedly was questioned by Howe and physical evidence was found on him. Rogers provided information about the case. According to tradition, Hale spent the night in a greenhouse at the mansion and then was marched along Post Road to the Park of Artillery, which was next to a public house called the Dove Tavern (at modern-day 66th Street and Third Avenue), and hanged. The executioner was the former slave and loyalist Bill Richmond, who later became famous as a boxer in Britain. The story of Hale's famous speech began with John Montresor, a British soldier who witnessed the hanging. Soon after the execution, Montresor spoke with American officer William Hull about Hale's death. Later, it was Hull who widely publicized Hale's use of the phrase. Because Hull was not an eyewitness to Hale's speech, some historians have questioned the reliability of the account. 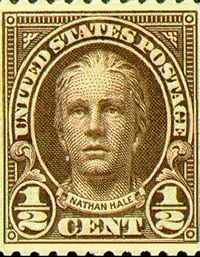 Nathan Hale appeared on U.S. postage stamps issued in 1925 and 1929. Likeness is from a statue by Bela Lyon Pratt. It is almost certain that Nathan Hale's last speech contained more than one sentence. Several early accounts mention different things he said. These are not necessarily contradictory; rather, together they give us an idea of what the speech must have been like. The following quotes are all taken from George Dudley Seymour's Documentary Life of Nathan Hale, published in 1941 by the author. From the diary entry of September 22, 1776, of Lieutenant Frederick MacKenzie, a British officer: "He behaved with great composure and resolution, saying he thought it the duty of every good Officer, to obey any orders given him by his Commander-in-Chief; and desired the Spectators to be at all times prepared to meet death in whatever shape it might appear." From the diary of Enoch Hale, Nathan's brother, after he went to question people who had been present, October 26, 1776: "When at the Gallows he spoke & told them that he was a Capt in the Cont Army by name Nathan Hale." However, at the gallows, he made a sensible and spirited speech; among other things, told them they were shedding the blood of the innocent, and that if he had ten thousand lives, he would lay them all down, if called to it, in defense of his injured, bleeding Country. From the Independent Chronicle and the Universal Advertiser, May 17, 1781: "I am so satisfied with the cause in which I have engaged, that my only regret is, that I have not more lives than one to offer in its service." "On the morning of his execution," continued the officer, "my station was near the fatal spot, and I requested the Provost Marshal to permit the prisoner to sit in my marquee, while he was making the necessary preparations. Captain Hale entered: he was calm, and bore himself with gentle dignity, in the consciousness of rectitude and high intentions. He asked for writing materials, which I furnished him: he wrote two letters, one to his mother (almost certainly to his brother Enoch; the letter was never delivered, but Enoch heard of it from another American prisoner, John Wyllys, who knew Nathan. Cunningham had shown him the letter to taunt him) and one to a brother officer." He was shortly after summoned to the gallows. But a few persons were around him, yet his characteristic dying words were remembered. He said, "I only regret, that I have but one life to lose for my country." William Hull, the only source for Hale's famous speech, is better known as the brigadier general who later surrendered the entire United States northwestern army to the British during the War of 1812. "Hate of oppression’s arbitrary plan, The love of freedom, and the rights of man; A strong desire to save from slavery’s chain The future millions of the western main, And hand down safe, from men’s invention cleared, The sacred truths which all the just revered; For ends like these, I wish to draw my breath," He bravely cried, "or dare encounter death." And when a cruel wretch pronounced his doom, Replied, "Tis well,—for all is peace to come; The sacred cause for which I drew my sword Shall yet prevail, and peace shall be restored. I’ve served with zeal the land that gave me birth, Fulfilled my course, and done my work on earth; Have ever aimed to tread that shining road That leads a mortal to the blessed God. I die resigned, and quit life’s empty stage, For brighter worlds my every wish engage; And while my body slumbers in the dust, My soul shall join the assemblies of the just." A plaque erected by the Daughters of the American Revolution (DAR) hangs on the Yale Club at 44th and Vanderbilt by Grand Central Terminal saying the event occurred there. There is also a memorial at another possible hanging site in Halesite (Huntington), New York, on Long Island. Nathan Hale's body has never been found. An empty grave cenotaph was erected by his family in Nathan Hale Cemetery in South Coventry, Connecticut. A statue designed by Frederick William Macmonnies was erected in 1890 at City Hall Park (the statue established Hale's idealized square-jawed image). A statue of Hale, sculpted around 1898 by Bela Lyon Pratt, was cast in 1912 and stands in front of Connecticut Hall at Hale's alma mater, Yale. Copies of this sculpture stand at the Phillips Academy in Andover, Massachusetts; the Nathan Hale Homestead; the Department of Justice in Washington, D.C.; and at the headquarters of the Central Intelligence Agency. 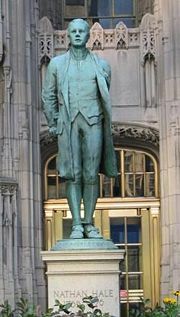 A statue stands at the front of the Chicago Tribune Tower in Chicago. "Nathan Hale Revisited" Library of Congress. This page was last modified on 8 November 2018, at 17:24.